Not yet a century old, Tel Aviv sprung up from the desert near Jaffa, soon becoming a sanctuary for refugees from all over the world. While the lively avenues, big squares and buzzing nightlife draw comparisons from locals to New York, the climate leaves no doubt to its Mediterranean setting. owner of legal office M. Pacovský a spol. I feel really good in this hotel, so I take the advantage of its restaurant as well. Favorite attraction: Marina Club in the Jaffa harbor where you can sit and chat into the late hours, or you can put to sea on a sailboat. Advice: Visit the Ramat Ganu district of Tel Aviv, where you can see the diamond exchange and some of the local grinderies for these precious stones. 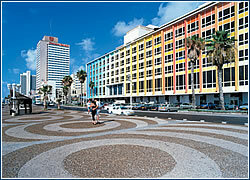 secretary, Czech-Israeli Chamber of Commerce Favorite hotel: Sheraton Tel Aviv Hotel and Towers, 115 Haayarkon str., tel. : +972 3 521 9300. Situated on the seashore, with a very good restaurant, Olive Leaf, suitable for business lunches. Favorite restaurant: Manta Ray, Alma Beach near Dolphinarium, tel. : +972 3 517 4773. Relaxed atmosphere, splendid sea view, fine appetizers, seafood soup. Advice: Tel Aviv Museum of Art, 27 Shaul Hamelech. Huge collection of famous impressionists and post-impressionists, in addition to the classics. Advice: Find an Israeli friend to take you around. Hotel at the seashore, well-equipped for conferences. Excellent antipasta, trout, and other fish stuffed with spinach. Favorite attraction: Visit Jaffa, only two km away, with its unique monuments from Egyptian pyramids to the time of Napoleon. Also, picturesque houses from the period of the Ottoman empire. Advice: Don’t forget to take your swimsuit with you. Sometimes you can go down to the huge, well-maintained Mediterranean beach directly from the hotel elevator. www.chamber.org.il – the Federation of Israeli Chambers of Commerce can provide advice and information on doing business in Israel. 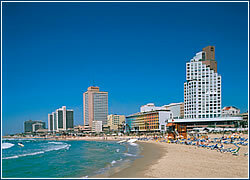 http://www.go2israel.org/telaviv.htm – at-a-glance travel and tourism guide that’s not too in-depth, but a good place to start. http://www.virtualtourist.com/vt/1a102d/1/21d7/ – mostly links here, focused on hotels and travel packages. http://www.iagora.com/itravel/icities/israel/tel_aviv/ic_index.html – site allows visitors to log in and chat with locals about specific details of their city. 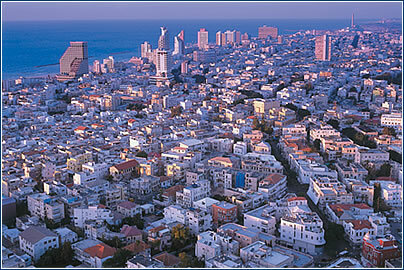 http://www.worldroom.com/pages/cg_telaviv/telaviv_main.phtml -a nice, cleanly designed site with info, tips, photos and links. http://www.israel-travel.net/travel.htm – useful link page, as well as info on discounted airfare and accomodation. · Tel Aviv is Israel’s economic and financial center. The national stock exchange is located here, along with the head offices of major banks and almost all the country’s insurance and finance institutions. It has a booming high-tech venture capital industry and is particularly strong in the areas of telecommunications equipment, software, internet and semi-conductors. High-tech medical instruments, innovative pharmaceuticals and the diamond trade (including cutting and polishing) also contribute substantially to the economy. · Major industries include clothing (much of it for outlets in Europe and America), food processing, metal and engineering, printing and publishing. Israeli manufacturing has a reputation for high quality and innovation. Tourism is another important contributor, comprising a significant source of foreign exchange earnings. · A procedure known as “Dual-listing’, launched in July 2000, permits larger Israeli companies to be listed both in New York – on the New York Stock Exchange, NASDAQ or American Stock Exchange – and on the Tel Aviv Stock Exchange. Around 50 international Israeli companies have taken advantage of this possibility. 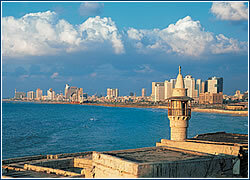 · The business community in Tel Aviv is highly sophisticated, with an international outlook. There is a strong preference for informality and plain-speaking. Business attire is generally “smart-casual”, jacket and open-necked shirt. Women dress stylishly but relatively informally, usually trousers or a skirt with a blouse or shirt. After introduction, it is customary to use first names. English is generally spoken well by businesspeople and is used out of politeness if non-Israelis are present. · Business opening hours in Tel Aviv are generally 8am-6pm Sunday to Thursday. On Fridays, businesses shut at 12:30 for Shabbat (the Sabbath), which starts Friday at sundown and continues to Saturday evening. Increasingly, Shabbat is being extended so that the whole of Friday is added to Saturday as a day off work.